In association with UK Palestinian solidarity and support groups, who have organised local meetings, Oxford Ramallah Friendship Association (Registereed Charity 1155620) is pleased to have arranged and coordinated a UK tour by Professor Mazin Qumsiyeh in which he will speak about environmental protection and human rights in Palestine. Oxford Palestine Solidarity Campaign and Friends of Birzeit University have co-sponsored the Oxford public meetings and Palestine Unlocked have given financial support for this visit. Professor Mazin Qumsiyeh is Director of the Palestine Museum of Natural History and the Palestine Institute for Biodiversity and Sustainability – Bethlehem University. He grew up in Beit Sahour, near Bethlehem. After many years in academia in the USA, he returned to Palestine in 2008. He currently teaches and conducts research at Bethlehem and Birzeit universities. Besides his academic work he is passionate about public education on ecology and the environment, and human rights. Amongst other meetings and visits, Professor Qumsiyeh will be speaking at a total of 11 public meetings including the London Middle East Institute (at SOAS) and Leeds University, meeting parliamentarians and meeting with key staff in both the London and Oxford Natural History Museums. In Oxford we are very pleased to have two public meetings which cover complementary aspects of Professor Mazin Qumsiyeh’s work and activism. We hope you can come and hear Mazin’s informative and inspiring talks. Environmental justice and sustainability in Palestine: challenges and opportunities –followed by a social event from 6 pm with refreshments, Oxford PSC stall, second hand book stall and copies of Mazin’s book: Popular Resistance In Palestine A History of Hope and Empowerment by Mazin Qumsiyeh (Pluto Press) will also be on sale. A collection will be made towards the Palestine Natural History Museum. Organised by Oxford Ramallah Friendship Association and Oxford Palestine Solidarity Campaign. Oxford University – Sharing the Land of Canaan. Organised by Oxford Ramallah Friendship Association and co-sponsored by Friends of Birzeit University (Fobzu). Chaired by Omar Shweiki of Fobzu. Copies of Mazin’s book: Popular Resistance In Palestine A History of Hope and Empowerment by Mazin Qumsiyeh (Pluto Press) will be for sale. 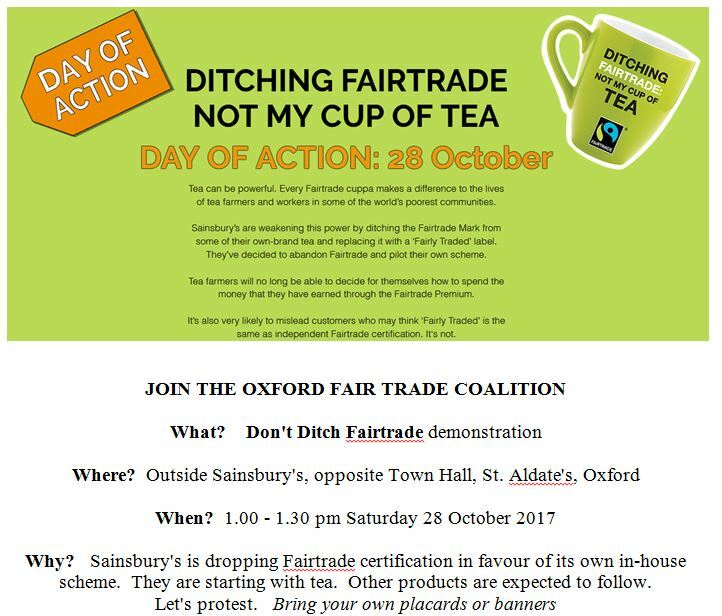 You are currently browsing the Oxford Fairtrade City blog archives for October, 2017.